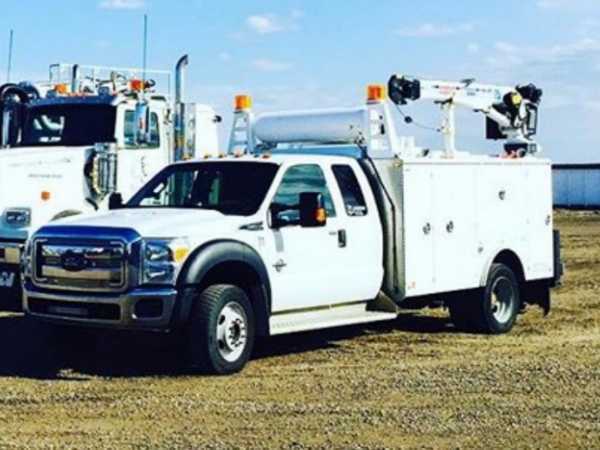 Mannville, Alberta – Vermilion RCMP are requesting the public’s assistance in locating a stolen service truck. The vehicle was stolen from Mannville in the early evening hours of March 21, 2019. The truck is a 2014 white Ford F550 with a service body and picker arm attached. Presently the truck will have front end damages and may have “Bulldog Energy” decals. Please see attached photo of the actual truck. The truck is a 2014 white Ford F550 with a service body and picker arm attached.